The GroupFire platform has three message types that make it easy to stay organized and up to date with the messages that matter most to you! With Conversations, your members can connect with anyone in your organization with just a few clicks. You can choose a private message with a coworker or effortlessly select a few people and create a private messaging room. 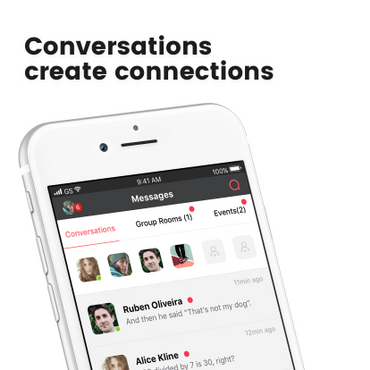 Click on the red edit button on the lower right and select a member or members to create a conversation. All conversations have individual notification settings. Group Rooms are permanent messaging rooms for your existing groups . In addition to the current group posting rooms, you (as an admin) will now have the option to enable a group room for your group(s)! Each system group can have a room. You can enable or disable this option when you create or edit the event. Members are only able to view and enter group rooms that they are members of. Notifications can be managed in fine detail by each member for each room. With Event Rooms it’s now easier than ever to for members to connect with fellow attendees and stay up to date on information from organizers! Each event can have a room. You can enable or disable this option when you create or edit the event.Event rooms only display only for members invited to that event. Use event rooms to allow members to discuss the upcoming event.Event rooms allow easy messaging from organizers to the attendees.